Through the hustle and bustle of the Memorial Union, a popular hub for students and faculty on the Oregon State University campus, an unlikely pair is seen indulging in cups of coffee from Java Stop, while engaged in a seemingly riveting conversation. Actually the pair is not that unlikely -- they could be mentor and protege, professor and prospective student, maybe even mother and daughter. But if you were to meet them, or to gain access to their conversation, you would find that these two are OSU art students, collaborators and good friends. For Paris Myers, 17, and Amy Isler Gibson, 61, age seems irrelevant. It is shared interests, determination, a strong work ethic, and the reference point of being an unconventional student that comprises the foundation for their friendship. Myers’ experience at OSU is unique because she started as a freshman at the age of 16. She had already immersed herself in a university-level learning environment after having taken multiple classes through the online program at Johns Hopkins University during her high school career at Crescent Valley High School. Her passions are many, and that is reflected in Myers’ plan to double major in bioengineering and art, and double minor in photography and art history. Now in her second year of studies in the OSU Honors College, Myers says art has been a part of her life for nearly as long as she can remember, but her love of science is a primary reason she also chose to pursue that discipline. “Art is meaningful in so many ways, and, though some may not think of it this way, is just as legitimate in explanation as most branches of science,” she said. Gibson’s experience as an art student is also unique. She already holds graduate degrees in philosophy and counseling psychology, worked as both a psychotherapist and philosophy instructor for years, and began her career in the OSU Department of Philosophy. But much like counterpart Myers, Gibson found herself yearning to continue the pursuit of multiple interests. And that is what drove her to return to school for a B.F.A. in art with a minor in art history. “Art can really thrive with excellent teaching and a tight-knit community, which the program here really offers,” she said. “I always say that the program and faculty are both humane and rigorous at the same time,” Gibson said. Gibson and Myers both say that part of their journey here at OSU is finding the answer to the question, “Is art illustrative or exploratory?” Towards that end, they have become two of the student founders of OSU’s new art and science club, “Seminarium,” supervised by professors Jerri Bartholomew, Stephen Atkinson, and Andrew Myers. Even though Myers and Gibson each say they experienced the feeling of diving head first into the deep end when they started their program as unconventional students, that common bond wasn't entirely realized until the College of Liberal Arts and OSU Extension’s collaborative “Creative Coast” trip of 2017. The “Creative Oregon” program takes OSU students from different disciplines to several parts of Oregon, showcasing each stop’s unique beauty, and gives them the opportunity to learn more about the state they call home. “We had a very similar experience on that particular trip,” Gibson said. “We were there to further our interest in both art and science, focusing on one of the most beautiful parts of the Oregon Coast. But the professionals who welcomed us included an incredibly important part where we were taught about the history of the Native Americans at Cape Perpetua, and learned that it was one of the places where they were forcibly starved out by the US government, she said. It was this mutual understanding that brought the two together for the rest of the trip, and added to their mutual goal of finding art’s deeper meaning. Almost a year after the Creative Coast trip, the pair now sometimes collaborates, including working together on a project that focuses on the Oregon coast. Their shared belief in art’s effect on knowledge and epistemology, and their mutual inclination to often say yes to new projects is driving them into fresh, creative ideas almost daily. Shared opportunities and academic accolades include their collaborative work in an advanced interdisciplinary course: “Art of the Microbiome,” and inclusion in a special discussion with visiting artist Michael Shultheis, who inspired the formation of the Seminarium Club in the fall of 2018. The two agree that the age difference has never drastically impacted their friendship, and has actually bettered their ability to collaborate on projects. 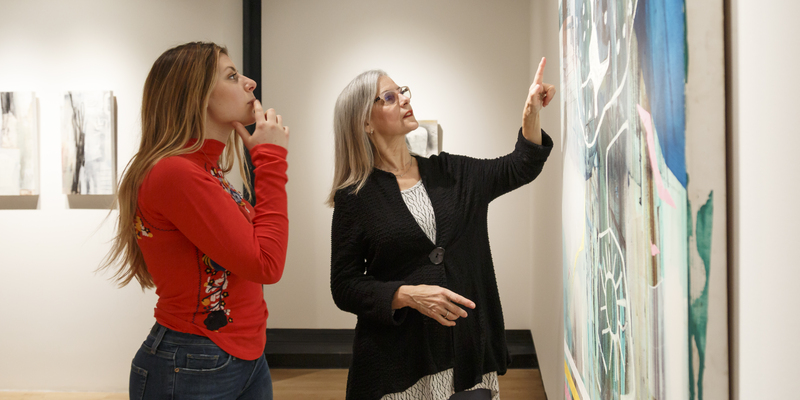 If you’re interested in keeping up with Myers and Gibson, their work is often seen in local galleries from Newport to Eugene, in addition to here on campus. Watch the university and the School of Arts and Communication calendars to find out about future exhibits of their work. Molly Duddlesten, a senior majoring in English with a minor in writing, is a writing intern for SAC Marketing & Communications. Photo by Zachary C. Person.